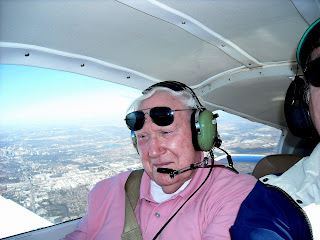 Today I flew with a special guest aboard our Grumman Tiger, Captain Rob Tuttle USAF retired. Captian Tuttle flew a B-29 in the Korean war and had his aircraft heavily damaged in one bombing run. He made it back safely but his aircraft was junked for spare parts due to the severe damage. 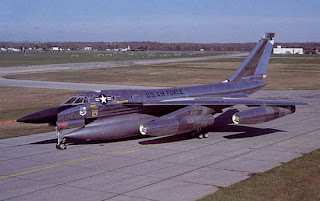 Later in life Captain Tuttle flew one of the first supersonic bombers called the B-58 pictured here. Tuttle also flew C-47's and DC-8's during his career. Shown here is co-pilot Tuttle's radar track as he flew the Grumman on a GPS-directed route to Fredericksburg, Texas. The track ends where we cancelled flight following with Houston ARTCC. This was the first time I've ever flown with a pilot that has flown at 2 times the speed of sound. A story I shall not forget! That hustler plane was one of the first planes I built as a model. I remember it VIVIDLY because of the four HUGE jet engines hanging off the bottom of the wings! Congrats on getting such a great pilot for a pax, and congrats on your new endorcements! Nice blog Charlie. Nice flying!